Thomas Edison’s favorite holiday was 4th of July; and he made his own fireworks to celebrate the day with some really loud boomers too! Edison was a big fan of the American revolution writer Thomas Paine. Edison was responsible for the words “Hello” on the telephone; and “bugs” in unproven inventions and new systems. Edison and his son Charles played very important roles in the US Navy in both WWI and WWII. Edison had the most recognizable face in the world, when newspapers and magazines were the chief means of communicating news. Edison was quite fond of pie, which friends joked that he ate by the yard. Edison had a tattoo on his forearm, a quincunx, like the face of the number “five” on a dice cube. A practical joker was Edison, and he gave as good as he got. His first two children were nicknamed “Dot” and “Dash” in honor of his early telegraph days. He taught his second wife Mina Morse Code, and proposed to her by taping it out on her palm. She tapped back, “Yes”. 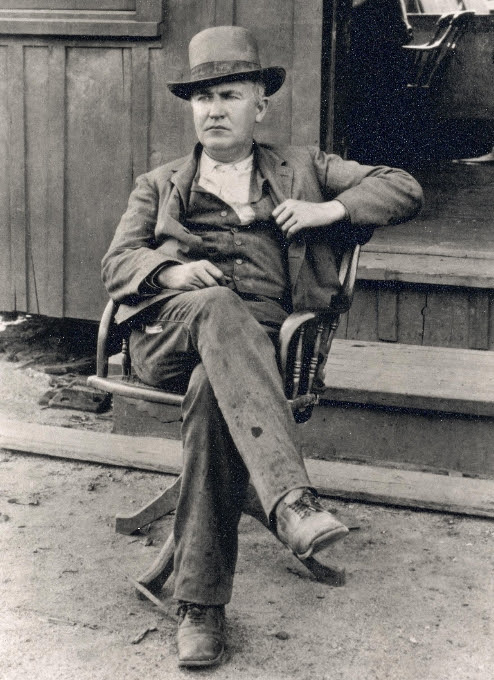 Regular bathing was not a big deal for Edison, and he often went several days without it. Hello my name is Emily and I am a 10 year old girl in fifth grade in Mrs. Durso class. I am working on a genius hour project about Thomas Alva Edison. We have been doing something called genius hour I Choose you because you are a better expert about Thomas Edison than I am so that is why I choose you. May you please answer some of my questions and give me some good websites. My questions are: how has Edison changed the world with his inventions? How can Thomas Edison’s inventions inspire people to create new inventions? How do you create a prototype of Thomas’s light bulb? Can you give me some intresting facts? Thank you for trying to answer some of my questions. When you are using your time. I hope you can offer me some good websites. And answer my questions. he inspire me to invent some thing,one day. Hi my names Dorothy.I’m in forth grade at driver elementary school.my teachers name is Mrs. Soriano.she gave us a project on a sintest and I chose Thomas Edison. I have to do a report but I need more research!…..
Hello its Dorothy agin. I got the email you sent me. Thanks it was helpful. I got the research I wanted. I am 11 years old 5th grade and Im doing a research report on Thomas Edison and this was very helpful. I was inspired a lot by Thomas Alva Edison, he was my key too success and that one day I would become something great with my imaginations and my creativity.